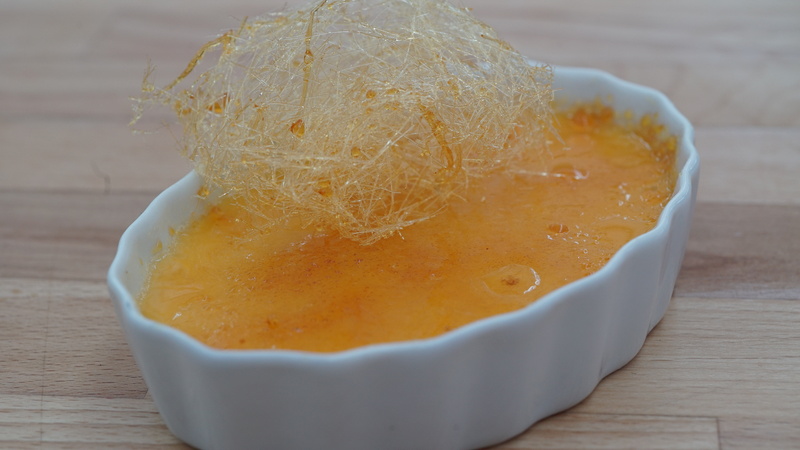 Stephanie Chen makes her Maple Fennel Crème Brulée recipe topped with a spun sugar nest for the "Custard and Meringue Week" signature bake challenge. She is hoping to stand out with the unusual combination of maple and fennel. Judge Mary Berry is concerned that Fennel is more of a savory flavor but Stephanie assures her the maple will balance it out. Watch the full episode of "Custard and Meringue Week" from Season 2 Episode 6 of The Great American Baking Show. 2. In a heavy, medium stainless steel pan, toast fennel seeds bare in a hot pan for less than a minute until you can smell them. Add cream and milk to the same pan and heat on medium low heat until just below boiling point make sure to stir with a whisk to avoid the milk burning. You'll be able to smell if it is burning. 3. In the meantime, prepare 2 - 9 x 13 roasting pans lined with paper towels (so they don't move) with the 6 x 3 ounce ramekins each. 4. Remove from the heat and let it infuse for 15 minutes. (Prepare boiling water as needed). 5. In a medium separate bowl, beat egg yolks, sugars, vanilla and maple extract with a small hand whisk until smooth and evenly blended. Stir in the maple syrup. Don't do this step too far in advance. 6. Reheat the cream mixture slightly till simmering. Add 1/3 of the cream to the egg mixture to the bowl with a ladle and whisk constantly as you're pouring it in so it doesn't cool the eggs too fast. Then continue to add the rest of the cream mixture, beating constantly, until well combined. 7. With a final metal strainer attached to a large heat proof jug, strain the mixture to catch all the fennel seeds. Then pour in each individual ramekin filling about 90% of the way from the top. 8. Bake in the middle of the oven. Move the pans to the rack AND THEN pour the water baths into each of the trays. Filling the tray about half way with boiling water. Be very careful so no water gets into the custard. 9. Bake for 20-25 minutes until lightly set in a shallow dish. Only the middle should jiggle slightly and the outer edges should be firm. To test gently shake the dish or tray. 10. Meanwhile. Start making the caramel sugar for the topping. 11. Remove the tray from the oven and carefully remove from the tray of water with tongs on a different tray. Set on a cooling rack for a few minutes then place into the fridge to chill. 12. Chill the ramekins in the fridge for as long as possible. These will need to be very cold before adding sugar to hand torch. 1. Prepare a baking sheet lined with a silicon mat. 2. Combine sugar and water in a pan stirring with a wooden spoon until the sugar is melted on a medium heat and bring to a boil. 3. After boiling, do NOT stir. It will be a very high and loud sounding boiling. After a few minutes add the cream of tartar that has been dissolved in some water. 4. Brush down the sides of the pan with a pastry brush so it incorporates and melts any dried bits of sugar from the sides. 5. The caramel will start going through different shades of amber. May take about 5-10 minutes. Once there is a tan color to the sugar, remove from the heat and pour half on a silicon mat prepared baking sheet. 6. Keep the rest of the caramel on a very low heat on the stove until ready to work with it. 7. Take the first half and place onto a silicon mat or parchment paper to cool and harden. Then place into a food processor to blend into a fine sugar then set aside. 8. The other sugar should be saved for making maple leaf decorations if there's time. 1. Add a layer of sugar to the top of each ramekin. Make sure it's a generous layer and clean off the edges if any sugar stuck to it. 2. Using a hand torch, slowly torch each crème brulee until dark brown in a circular motion. 1. Make a dry caramel in a saucepan. Mix until amber brown. 2. Remove from heat and wait for sugar to thicken. 3. Prepare large bowl with two wooden spoons resting on top. 4. Once sugar is right consistency, take wooden fork and quickly wave it over the wooden spoons to create sugar stands. 5. Gather together to a ball and place on top as garnish.